Ronald Joyce has earned its place as one of the leading bridal collections in the world, designed by London based Veni Infantino. As a designer, Veni creates unmistakeably elegant and feminine gowns. Because we are premium stockists of the Ronald Joyce Bridal Collection, our collection of Ronald Joyce dresses arrives in store before many other bridal stores. Our current collection of Ronald Joyce gowns offers diversity, with fashion forward styles which are pushing the boundaries of traditional bridal fashion. Brides-to-be can select from a range of slim silhouettes for that perfect body hugging fit or A-line and fuller skirt options for a more sophisticated approach. 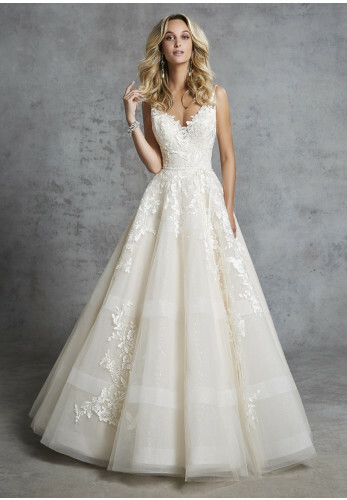 Beaded lace gowns beautifully adorned with Swarovski crystals and tiered skirts all feature, using tulle, lace, satin and taffeta in their designs. The Ronald Joyce collection focuses on offering stylish, well-made wedding dresses for every bride, regardless of budget or size.Our brides love our selection of Ronald Joyce designs and enjoy various style options. They also love our prices, as they offer great value that never compromises on quality and style. Brides commented that Ronald Joyce wedding dresses remain true to design, regardless of size and the quality of fabrics used and flawless attention to detail will always make these gowns an attractive option. Ronald Joyce wedding dresses are available in sizes 4 to 30 with a selection available for purchased off the peg and special orders taking 16-20 weeks. We do, however, have a selection of wedding dresses which can be delivered within eight weeks. With our extensive range of Ronald Joyce gowns, it isn’t always possible to showcase all of our dresses on our website, please contact us directly if you are looking for a particular style as we may have it in the Bridal Rooms. If you are looking for a beautifully designed, sophisticated and elegant Ronald Joyce gown for your wedding day, then our extensive bridal collection is a definite must see.